What happens when a guest leaves a restaurant? Duties and responsibilities of busser or buss person or busboy or busgirl begins then. A busser is the person who is mainly responsible to clear the table after guests finishes his meal and leaves the restaurant. A busser performs wide variety of tasks to help the waiters and other service staffs in order to provide best possible service to guests. Good restaurants run like a well oiled machine, and each individual position must do their part to ensure that. Bussers (or busboys for the gendered version) are an integral part of the restaurant machine. The service industry is fast paced, and the best way for a restaurant to make more money, and a waiter to get more tips, to then pass along to a busser, is to get tables cleared and reset as fast as possible, to get more people sat and make satisfying their dining experience. And nothing is more dissatisfying as a customer to be waiting for a table at a restaurant, when you can see an abundance of open tables that just need to be cleared off and reset. Its an important job. Now, no one is going to say its glamorous. Often, people in the industry say that bussers do all the things that servers don’t want to do. And that may be partially true. But waiters tip bussers for their services. We can define the term busser in this way, a busser is a service staff working in a restaurant or hotel or motel or cruise ship or club, who clears the table when guest finishes his meal and then reset the table with fresh linen, silverware and glassware, refill water glasses, helps waiter or waitress to serve guest and also acts like housekeeper when needed. Bussers are known by different names. In America, a busser is called as a busboy or busgirl, or bus person. Also they are known as dining room and cafeteria attendants. Again these terms are not popular among British people. In British English, busser is called as commis waiter or commis de rang or commis boy or waiter’s assistant. All these terms are same which refer to busser or bus staff. There is a related term we should also discuss which is “bussing tables”. Basically it is what a bus staff does. 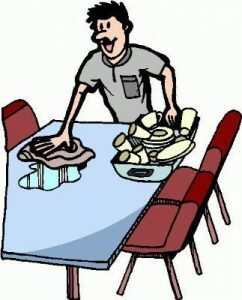 Bussing tables means clearing dirty or used items like napkins, dishes, silverware or glassware and cleaning the table. By the way, don’t get confused that is it bussing or busing. It is bussing. Busser is an entry level job position. In an organization chart, the lowest rank food and beverage service staff is the busser. That’s why an employer really doesn’t demands much while hiring bussers. In fact no post secondary level education or certificate or even previous job experience is required. There a busser has to have certain qualities like ability to stand for a long time, clean tables properly, lift heavy objects and politely talk to guests and overall a friendly service attitude with good communication skills. There are many people who are enjoying high level management positions at hotel or restaurant, have started their career as busser. This is a very good entry level job to enter the hospitality industry and start someone’s career. Many times this position is filled by trainees. Employers also enjoy very little risk to hire someone for this position and if that person can perform well then easily he or she is promoted from busboy to waiter. A busser or busboy or bus person performs a lot of duties in a restaurant. In some restaurants, busser comes at the very beginning after guest seated and menu is given by waiter. A busser then pours water, refills tea and coffee cups, takes bread and butter to the table, clears tables and even serves food and beverage items during busy period when waiter is not available. He also cleans table and chair and resets them with fresh linens, clean service ware and glassware. Restock dining room with tableware, flatware, utensils, condiments and linen. Maintain adequate supplies of required items in side stations when the restaurant is open. Clean table and chairs that includes highchairs and booster chairs. Reset table and chairs and put fresh linens, clean silverware and glassware. Pour water and refill tea and coffee cups. Remove soiled and dirty items like used napkin, silverware, glassware etc. Brings foods from the kitchen and place on the table. While bringing used items must keep chinaware, glassware, flatware separated. Serve food and beverage items in extremely rush periods when waiters cannot attend every table. Must maintain communication with hosts, kitchen staffs, dishwashers, restaurant manager, and food servers. Must attend all guest requests, special needs. Provide supplementary items to guests if required. Return soiled linen items to the laundry. Make food preparation cart empty and clean. Education: High school degree. Must be able to talk in clearly in required language. Experience: None required but similar working experience will be appreciated. Physical: Must be able to lift heavy objects, stand for a long hours, move quickly, carry trays and other objects that may weigh up to 25 pounds or more. Don’t overstock items that will invite breakage and unwanted accidents. Do not talk unnecessarily with guest. Be friendly but professional. You must be in real hard pressure most of the time but don’t lose your cool. Even in rush hours walk fast but don’t run. Safety comes first. If there is any broken chinaware or glassware then act immediately. If there is any spilled liquid in the floor, immediately mop the area or at least inform housekeeping. You may wonder how much does a Busser make. According to the latest report from Bureau of Labor Statistics, in USA, 423,080 people work as busser or busboy or Dining Room and Cafeteria Attendants and Bartender Helpers. Among them, 273,830 people work at restaurant and other eating places. On average, bussers or busboys make $10.74 per hour and $22,340 in a year. Bussers who work at drinking places where alcoholic beverages are allowed earn slightly more money ($22,560 per year) than other buss persons who work at Rooming and Boarding Houses ($20,530 per year) or Restaurants and Other Eating Places ($21,720 per year). In Canada, bussers or busboys are making around $20,530 per year. Generally very young people, from 16 to 18 years old, unskilled without experience adult enter in hospitality industry as busser or bussboy or bussgirl or bus person. This is not high paying career path but if you really have no other choice, if you are student who can work part time basis, if you don’t have any good degree or experience but want to work in hospitality industry then working as a busser should be a right choice. If you can make your presence felt, very soon you will get chance to be promoted as waiter. Johnny Depp, Langston Hughes, and Jon Stewart all worked as a restaurant busser at one point in their life. Its a tried and true position in the restaurant business that will always need doing, and will always need doing well. Once you have experience on your restaurant resume as a busser, it will be much easier in the future to get a job as a restaurant host or hostess, and one day train your way into waiting tables, where the real money is made. But everyones got to pay their dues in one way or another.